Every year the Electronic Frontier Foundation reads the privacy policies of the data plans and social networks many of us deal with, they ask their lawyers questions about how the policies are enacted, and then they give them stars. 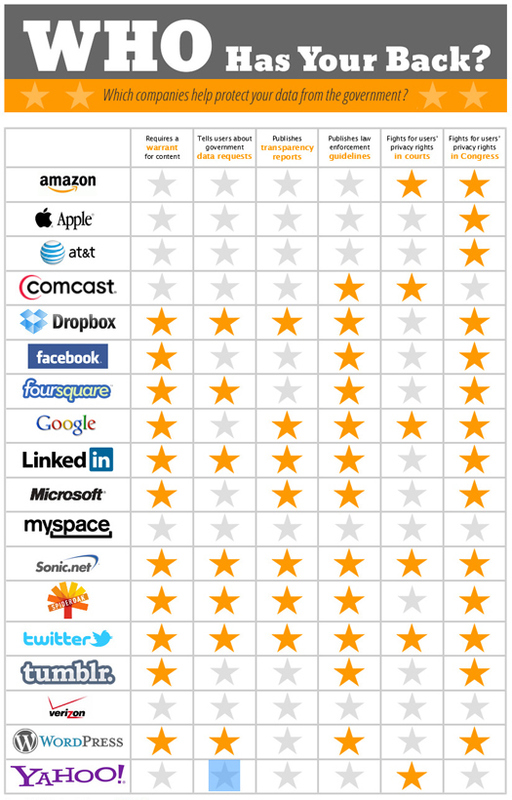 My preferred wireless carrier, Verizon, earns no stars – giving it the same standing as MySpace as a voracious protector of my privacy. The old phone companies (RBOCS) are so highly regulated, it is very hard for them to stand up to government requests not just to sniff through their data, but to just go ahead and grab as much of it as they like. See the EFF’s full study here — and please help put some power behind the findings by sharing them widely. 4 Responses to "EFF: Verizon Doesn’t Care About Your Privacy, Others Do"
Next week, you can get free pancakes served to you on National Pancake Day at IHOP. to work for free, by donating his artwork, he can not only help your charity, but further his career. of wiring down the towdr to its finish use.